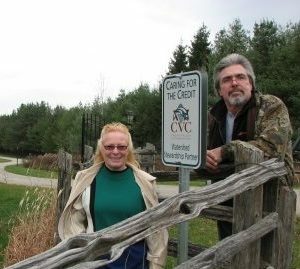 Having moved to their 33 acre property eight years ago, Ralph Sturgeon and Diane Robinson candidly admit they were apprehensive about working with CVC. Situated in the rolling hills of Hillsburgh, Ralph and Diane have two ponds, a 25-year-old plantation and lots of lawn. “We want less grass and more trees,” they both say. Having an older plantation on the property, they are able to imagine what their newly planted woodlot will look like and they’re excited to watch it grow. In the spring of 2012, Ralph and Diane created their new forest by planting 1500 evergreen seedling and 250 native trees and shrubs. “We love the variety of what CVC planted. There are Basswood, Hazelnut and Pasture Rose for colour,” says Diane. The pair diligently watered their new seedlings all summer long. Considering the drought of 2012, their survival rate has been miraculous! “Diane has spent hours out there mowing between all the trees. She loves it,” says Ralph. Mowing around newly planted seedlings in the first few years helps reduce competition for light and nutrients from other vegetation. It gives the newly planted trees an extra boost towards a robust life. “I’ve been doing the watering,” says Ralph. He’s so invested in the success of the planting, he’s considering purchasing a power sprinkler which will help him reach more trees without carrying so many buckets of water. By partnering with CVC, Ralph and Diane also learned about the Managed Forest Tax Incentive Program (MFTIP) which they qualify for. CVC prepared their Managed Forest Plan and the couple now benefits from a 75% reduction of property taxes.